Mutant Manifesto provides a horrific examination of the magic and mechanics of mutation, blending elements of science fiction and fantasy in a magnificently mutated melange. This product is ideal for alchemists, summoners, and wizards seeking to create their own mutated minions and awful experiments, but it also deals with the hateful backlash against all manner of mutants. From spells like blightcore meltdown, summon horde of flesh[, and the ominously titled one of us to genetic purification and mutagenic reversion, this product covers both sides of the mutant question, with the deviant (wizard) and xenocidist (ranger) archetypes standing forth as paragons of genetic purity or perversion. More feats and spells await within, as well as a sample grimoire delving into the twisted arts of mutation, the dreaded libram Omnia Mutandis! This gothic AP-plug-in is 21 pages long, 1 page front cover, 1 page editorial/SRD, 1 page ToC, 2 pages introduction/how-to-use, 2 pages of advertisement and 1 page back cover, leaving us with 13 pages of content, so let's take a look, shall we? The concept of degeneration and eugenics is not that young, as anyone who has studied the topic can attest - still, we often consider mutation a trope closer to the scifi genre. The introductory text covers some concepts and ideas that the introduction of mutations into a setting will entail before diving into new archetypes, first of which would be the Deviant, a wizard archetype: Instead of arcane bond, the deviant gets access to mutagens and the extra discovery feat for the purpose of getting access to more mutagen-related discoveries. At 3rd level, you may permanently sacrifice two spell slots of the highest level you can cast for further extra discovery-feats for mutagens. At 5th level, efficiency of spells versus magical creatures, aberrations, eidolons, etc. is slightly increased. At 10th level, you get an alien familiar you may imbue with eidolon-evolutions by sacrificing spell-slots and finally, at 15th level, mutagens last longer. The Xenocidist ranger is a master of influencing crowds (and inciting them to violence via a limited array of bardic performances) and sworn enemy of degenerate hybrids like ogre-kin (but not e.g. half-elves), which he can later even sniff out. At 4th level, the Xenocidist learns a judgment (one of up to 3) and gets a special one to cause devolution or mutagenic reversion via crits. They also become particularly resilient to transmutation-spells and immunity to polymorph effects. At 16th level, he even gets essentially evasion for fort and will-saves (à la 3.X's Mettle (Ex)). We also are introduced to 7 new alchemical discoveries: Aberrant Mutagen grows eyeballs for all-around vision and tentacles, with synergy with the tentacle discovery. With the greater version of this discovery, range is increased and 25% chance to ignore precision damage/crits, stacking with unusual anatomy. Speaking of tentacle: Gaining an extra tentacle is possible, as is making mutagens he can inject into adversaries (or allies) - oh, and extracts can be made infusable as well! Bombs that deal effects of fleshcurdle and those particularly effective versus aberrations/mythos creatures are also possible. We also get 3 new feats, one of which weirdly follows a different formatting than the other two - minor glitch there. Mutagenic Summons allow you to apply the mana-wasted creature template to creatures you conjure forth - at CR +1, these creatures get DR/cold iron (5 or 10 depending on base HD), reduce flight, if applicable, to clumsy maneuverability, one of 5 abilities (acid resistance, acid pustules, breath weapon, diseases, improved speed) per 4 HD and 1 of 4 deformities that come with unique benefits and penalties. The Xenophobia-feat may make you a bigot, but also particularly effective versus aberrant and mythos-related adversaries. On the other end of the spectrum, Xenophilia makes you get easier along with alien creatures, but also makes you slightly more susceptible versus their charms and compulsions. Both have in common, though, that they are not particularly compelling in their benefits. Next up would be 12 spells - and boy, these are complex - from the fleshmelting fleshcurdle that can hamper attacks, defense or movement to Blightcore crystal meltdowns that not only deal damage and increase the prowess of polymorph effects, but also hampers teleportation. What makes this spell stand out, is that [force]-effects may temporarily save you from it - its interactions like this that make this stand out to me. Now fantasy racists would love the Genetic Purification-spell: On the one hand, expunging diseases and polymorph effects - on the other, you can actually transform half-elves etc. permanently into humans. Now If you can't conjure a chilling story around that spell, I don't know what would suffice. Creating fleshcurdling mist, reverting mutated adversaries, creating a mutation-inducing plague, warp target's flesh via the complex, more than a page long Mutation-spell (including madness-rules-support!) or its mass-version, forcing the mana-wasted template on foes (and mind-controlling them! ), summoning icky hordes or unstable isotopes - these spells uniformly rock, though the mutatnt-calling spells feel a bit like filler to me. Editing and formatting are very good - though I did notice minor glitches here and there, no significant ones have crept into these pages. Layout adheres to Legendary Games' drop-dead-gorgeous two-column full-color standard and the pdf features glorious full-color artworks (as well as a line-drawing, which, while nice, feels a bit out of place amidst the other artworks). The pdf comes fully bookmarked for your convenience. So Jason Nelson delivers a variety of Mutation-themed options - and partially, they're glorious: The spells are awesome, the template cool, the prose of the Grimoire is simply legendary. But not all - the mutagen-focused wizard is nice, but nothing to write home about. The Xenocidist is nice as well, fun even, but left me wanting more - more demagogue-style hatred-inciting, more fanaticism/zealotry. Two of the 3 feats are bland at best and may make sense in a story-context, but wouldn't see me even consider them from a build-perspective. That being said, the template is cool and will also see some massive use beyond Golarion, e.g. in respective Midgard-campaigns - Wasted West, baby! Still...it took me a while to get what I was somehow missing - the mutation-component could have been a bit more pronounced; more mutation-options for spells/template etc. would have made this better...but then again, I'm perhaps spoiled since Chaositech is one of my favorite 3.X-books. Another point would be that this book's focus is a bit diversified: On the one hand mutants, on the other, their adversaries. And try as I might, I consider the call for purification as depicted by these fanatics as chilling as the mutations - one pdf on mutations and one on the fanatics of purity, both offering more space to develop their respective brands of creepiness, would have been awesome. What about a mutation-template-kit that makes eidolon-evolutions into a diy-mutations template? That would have just been awesome and added further value to this pdf that continues to expand as new material for eidolons. Don't get me wrong- this supplement is a great buy, but it also feels like it slightly falls short of what it could have accomplished with a tighter focus/more page count devoted to the concept of mutations and perhaps a second book for foes of mutants. In the end, I still wholeheartedly recommend this supplement at 4.5 stars, rounded down by a slight margin to 4 for the purpose of this platform. 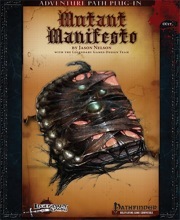 Mutant Manifesto is a PDF from Legendary Games in their Adventure Path Plug-In line covering mutations that twist the mind and flesh. It runs 21 pages, with one for the cover, one for credits, one for the table of contents, two explaining what the line/product is as well as some words on Legendary Games and what can be found in the PDF, two pages showing what else LG offers, and one blank back cover. That leaves 13 pages for the twisted goodness within, so here we go! After a page-long discussion covering how to use the idea of mutation in gothic horror and dark heroic fantasy, the PDF offers a pair of archetypes. The Deviant is one for wizards who wish to get in on alchemist-style mutagen fun, allowing the character to take the Extra Discovery feat, but only for mutagen-affecting alchemist discoveries. You are also allowed to swap out some of your spells gained per level to get Extra Discovery as a bonus feat. You also eventually gain a familiar with the celestial or fiendish template, as well as the ability to buy summoner evolutions for it by sacrificing one spell slot per spell level you can cast. And your spells are harder to resist when cast on certain alien or mutated creatures. You can really build up one freaky mage and familiar with this archetype. The second archetype is the Xenocidist for the ranger. Basically a ranger who loses their spell-casting ability in exchange for some inquisitor judgements, favored terrain for the ability to whip up angry mobs like a bard, and a limited number of potential favored enemies as well as resistance to polymorph and transmutation effects. This is a very unusual yet flavorful archetype, and can lend itself to some modifying for people who want to make it an enemy of undead, fiends, or almost any other class of creature. Then we get several alchemist's discoveries revolving around mutagens that can make you into an aberrant creature briefly, sharing your flesh-bending mutagenic gifts with others, and bombs that are more dangerous to aberrant and (Cthulhu) mythos creatures. And of course lots of tentacles. Next are a few feats for xenophiles and xenophobes as well as a way to grant the mana-wasted mutant template to summoned monsters. After this we get a list of some new spells that revolve around creating and fighting mutants. Probably the best are Blightburn meltdown, which damages and sickens opponents, interferes with teleportation, and enhances polymorph effects; and Genetic Purification, which can strip the various 'half-' templates from others as well as turn those half-elves, half-orcs, tieflings, etc. into normal humans. You can also transform enemies into mana-wasted mutants (the latter template is thoughtfully reprinted in the PDF), inflict random mutations on them, summon mutant monsters or something called 'hungry flesh'. The latter is listed as being described as Pathfinder Bestiary 4, which seems inconvenient for those who lack the book. In all, I really do enjoy this PDF. The archetypes, spells, mythos time, and everything else, all have that lovely creeping feeling this sort of a subject should have. My sole major complaint is that it allows you to summon some monsters which haven't even been released as yet, and in a book which may be out of the price range of some buyers. That is however a minor quibble when compared to everything you can use, with the PDF having hotlinks for anything and everything other than the new monster spell and material from the main Pathfinder rulebook. If you want some mutants in your game you'll want this PDF. I'll make it 4.5 stars for the reasons I listed, rounding it off to 5. Woo, thanks for getting it up before the weekend Liz! You are my hero! Arrgh, and now I have to wait until next week to get a copy! Still, just from the description this one sounds like it'll be great. Pathfinder has really needed a detailed source for alchemists and mages who wanted play Saruman/Moreau and craft their very own twisted abominations. That's the hope. This might dovetail well with the mental and surgical manipulations in the Mad Doctor's Formulary as well, for really dialing up the crazy mutant madness. I'm having problems buying it from your site, it won't give me the option for anything but a print edition. When I uploaded it, I had forgotten to click the button that said "disregard shipping for this product," since it's a PDF and there IS no shipping. I went back in and fixed the problem yesterday, so full speed ahead with the buy, Buy, BUY!!! Whelp guess they've got my money again. Holy crap I am loving the Xenocidist. As a Gm with an Ogrekin cleric playing in my next game I cannot thank you enough for this. Is this good for Numeria? Ha, glad you are enjoying. As an old-school Gamma World player way back in the day, I always loved the jerkass Knights of Genetic Purity as an ambiguously villainous secret alliance. Zoopremists beware! Let the Eugenics Wars commence!!! Jason, what's the purpose of this text in Inject Infusion? Even if the extract duplicates a spell with range of close, medium, or long, when used by an alchemist it must be injected to be effective. Mostly wondering if there's something about Infusion I don't know that makes that necessary. The basic infusion discovery lets you create an extract that someone else can DRINK, and while it's not explicitly stated I've seen some people suggest that since extracts must be drink then infusions should only apply to touch spells. The Inject Infusion is explicitly designed to allow you to jab people with infused extracts without them having to drink it, so just to avoid any possible confusion with different people's interpretations of what the extract and infusion rules SHOULD mean, I called it out specifically as allowing you to duplicate non-touch spells. Consider it going the extra mile to avoid arguments later about what it means. Ah ok, thanks. That's what I assumed was the reason you put it in there, but wanted to make sure. Just posted what will hopefully be the first of many reviews. I hope it's helpful to potential customers. Thanks for the review, Eric! I did want to point out that the Bestiary 4 is available, having come out at the end of October, prior to the release of this product, and that the PDF version of Bestiary 4 can be purchased right here on Paizo.com for just $9.99. As far as just wanting the stat blocks for monsters, the Bestiary 4 material will also be available very shortly for free online on the Pathfinder PRD as well as community sites like the Archives of Nethys and on d20pfsrd.com. Nice review, Eric! This is also on my list of things to do, but still a bit down the line... Your review made me want to read it soon - so great job! @James Nelson -- Woops! I thought that book was yet to be released. My mistake. @End -- thanks! I really think you should like this one. I have a question about alchemist discoveries. Legendary Games sent out a sampler of discoveries in an email back in October. Written by Clinton Boomer and Jason Nelson, the download said the 3 discoveries (which were cool tentacle stuff) were excerpts from Omnia Mutandis. Is that going to be a separate PDF or was it a reference to this product? And how many discoveries are in the Mutant Manifesto? I believe Jason simply renamed Omnia Mutandis to Mutant Manifesto. So, they're probably the same thing and the "tentacle" discoveries you saw are likely contained in this product. However, I didn't work with him on this one, so I'm not 100% certain. He'll probably be along to confirm for you sometime later today. That's where my confusion started. It was renamed. Turns out my GM had a copy of Mutant Manifesto and confirmed it had the alchemist discoveries I was looking for. Thanks for the info. I saw the other day that the Omnia Mutandis is actually an alchemist's tome which gets described in the Mutant Manifesto. A lot of these gothic grimoires have unusual names for the mysterious tomes they describe. So, both names are apparently applicable. The actual product is Mutant Manifesto. But the product contains information which describes an unusual book your PCs can find called Omnia Mutandis, and its alchemical-soaked pages carry all sorts of unusual properties. And it is quite good sir. I will say I would love to see more stuff in this and the rest of the gothic grimoires vein in the future. Is there any chance you guys will be doing more with the sanity, mythos, and tomes mechanics you guys have already established and adding onto them in the future? I would love to see you guys bust out some more tomes and sanity shattering creatures and disturbed archetypes some time soon. Some things you cannot un-see. Question about the Mutant Manifesto. What is the DC of Mana Fever when you contract it from the Omina Mutandis?